With all the hype surrounding web 2.0, it seems odd that we are already talking about web 3.0, or what some are calling the semantic web. One of the key reasons driving the move towards a new web is the pending shortage of addresses. Both Google and Yahoo are moving towards the new semantic web, but today you can try it out on Truevert, the new Green Web Search Engine. So just what exactly is the future of the web? Below is a snapshot of some of the buzz surrounding what to expect from the next web. Semantic Search – Well, I’ve read far too much about semantic search and to the best of my understanding it appears that they’ve taught computers to learn the meaning of words based on popular interaction. I could have very easily jumbled that definition so here are some more resources and how the folks over at Truevert describe it. And this new version of Truevert is “focused on green, environmental awareness. All searches are done from the point of view of environmental and social concern.” Looking for more on the new semantic web, and web 3.0? Check out Twine! and the links below. 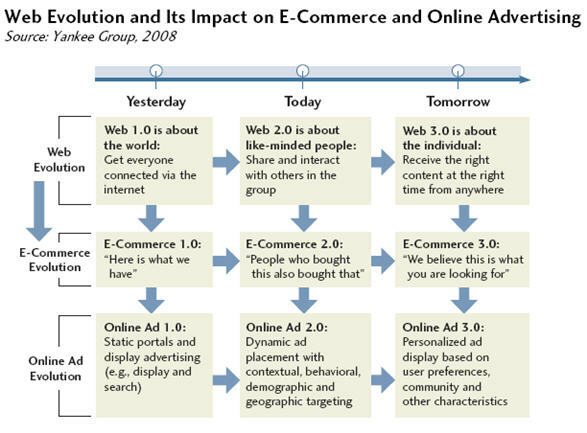 Customization – A few weeks back, a colleague of mine over at Navel Marketing posted this cool graph from the Yankee Group about trends in web functionality. Some of the web 3.0 features are already appearing in many of todays internet experiences but to look for more of a customized experienced in coming years. Technology Integration and Conversion Metrics – As the Internet, TV, and mobile technology continue to merge, AC Nielsen and Google are making plans to better understand what prompts conversion. Almost exactly a year ago, Google connected with the Nielsen Company to provide metrics to support it’s Google TV Ads platform. Look for Google to continue getting involved in answering every marketers dream of better understanding what truly converts consumers to action.